Sixteen-year-old Megan Bennett had been frightened nearly out of her mind last year when professional killers from a European Cabal and the FBI chased her, her pretend-brother, Nick, and his best friend, Jim, all over Clallam County, Washington. Nick had not known he was something special until the bullets started flying. But Nick was so special their biology teacher, Mr. Clarke, turned out to be the head of his secret protection detail. She and Jim had survived, but Nick and Mr. Clarke were killed when their SUV exploded. Or so it seemed. Imagine her surprise a year later when she opened her front door and Mr. Clarke stood there. Nick was alive and she could go see him. Only that’s not what happened. What happened was a terrorizing series of events which made last year’s hunt seem tame. This time a lot more was in the balance than her life. And this time she was going to have to fight back or everything and everyone she loved would be destroyed. 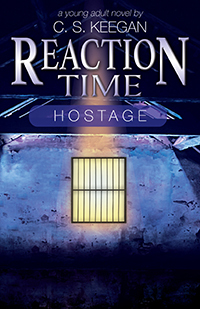 Reaction Time—Hostage is book two in a three book series concerning the results of genetic experiments on human embryos. Evolution has already produced rare individuals with bone density eight times normal and others whose blood chemistry produces superhuman muscle strength. Throw in a sociopathic geneticist who thinks the brain can be radically improved with a little trial and error and what could go wrong?